Knowing how to properly tow a trailer is an important skill to have. After all, there's a good chance that at some point in your life, you'll need to do it. 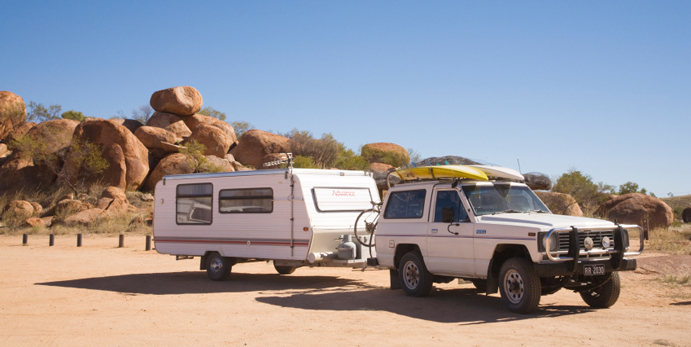 Whether towing a cargo trailer during a move, towing a camper for a camping trip, or anything in between, safe towing is a must. Specifically, there are a few towing tips that you'll want to follow to keep yourself and others safe on the road. Start by making sure that your vehicle is capable of towing the load that you need to transport. You can check your vehicle's towing capacity by checking your owner's manual. This is extremely important because exceeding your towing capacity by even a small amount can reduce your ability to brake and make handling very difficult (and downright dangerous). When calculating the weight of your load, make sure you factor in the weight of the trailer itself in addition to whatever will be loaded inside of it. The manner in which you load up your trailer can also affect your safety on the road. Specifically, you'll want to make sure that at least 60% of the weight is loaded near the part of the trailer closest to the hitch. This will help immensely with handling and help to reduce the possibility of fish-tailing. Furthermore, you'll want to make sure all of your cargo is properly tied down--especially if you're using a non-enclosed trailer. It's a good idea to stop after the first 20 miles or so of driving to ensure that the contents of the trailer haven't shifted significantly while driving. Not only is checking your towing capacity important, but so is using the right hitch for the job. You'll want to make sure that the hitch you're using is rated for at least the total weight of your trailer and cargo (ideally, it will be rated for much more). Otherwise, you can actually end up losing your trailer while driving, which is obviously an awful situation that you don't want to be in. Speaking of which, make sure you use chains and attach them in a criss-cross pattern as a back-up technique to protect your trailer in the unlikely event that it does slip from the hitch. When towing a trailer long distances, it's always a good idea to make periodic stops and check on your trailer and hitch. Specifically, you should make sure that everything is still properly attached and tied down. This is also a good time to check the tire pressure on both your vehicle and trailer. Proper tire pressure is a must for increasing your handling and maneuvering. When you're towing a heavy load, you'll naturally need to give your vehicle more time to brake while driving. As such, you should always keep your eyes on the road and anticipate your need to brake as much as possible so you can avoid having to slam on your brakes, which can be dangerous. It's also a good idea to reduce your speed overall so that the time and distance needed for you to brake is smaller. This is especially important for freeway driving, where you generally shouldn't exceed speeds of 55 miles per hour while you're towing a trailer. These are just a few important safety tips to keep in mind while you tow a trailer; by following these tips, you can keep yourself, other drivers, and the load you're towing safe on any trip you take.